Environment Agency Fisheries Enforcement Officers in the North East are continuing their crackdown on illegal angling. 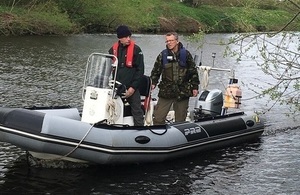 This week they carried out boat patrols on the River Tees on the lookout for people fishing illegally. On Wednesday they reported two men for fishing for pike during the coarse fishing close season near Preston Park. The close season prevents fishing for coarse fish for 3 months to give the fish a chance to breed. It runs from 15 March to 15 June inclusive. "The Environment Agency’s role is to protect fish stocks and improve fisheries. This includes rescuing fish in distress, improving habitat and restocking rivers across the region which have been affected by pollution or poor fish passage. "However, the close season means fish are left alone during the spring to allow them the opportunity to breed. During this time our specialist enforcement teams police illegal fishing as they do all year round to ensure compliance with the law." Enforcement officers have checked around 500 anglers since the beginning of April so far, with most being fully licensed and compliant. Enforcement officers have reported 15 people for offences. "We take all kinds of illegal fishing very seriously, whether it’s those fishing without a licence or licensed anglers using illegal equipment. "It’s not fair on other anglers who make sure they fish within the law, and also endangers the future of the sport by damaging the sustainability of fish stocks. It’s really important people report information about suspected illegal fishing to us so we can investigate." The Environment Agency’s work is intelligence-led and they work closely with partners to target known hot spots and where illegal fishing is reported. It urges anyone to report illegal fishing by calling 0800 80 70 60.